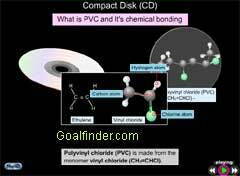 The concept of polymers through chemistry of a Compact Disc is introduced. Explanation of forming a dimer and trimer from a monomer is given. Looking at a CD it is difficult to imagine it is just a chemical - vinyl polymer. This animated science and technology topic makes the understanding of polymers easier. What are Pits and Lands on CD? What is CD made up of? What is PVC and How it is made? What is a free radical polymerization? What is use of PVC? 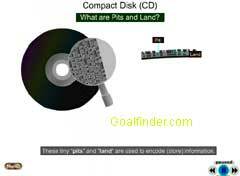 A CD disk contains a long series of grooves written helical (called pits). These tiny "pits" and "land" are used to encode (store) information. 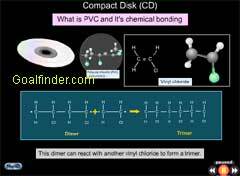 Compact disks are made up of poly vinyl chloride that is synthetic plastic polymer. It is prepared by the free radical polymerization of vinyl chloride. PVC is useful because it resists two things : fire and water. Because of its water resistance it is used to make raincoats and shower curtains, and of course, water pipes. Ans: The animation shows polymerization of the monomer vinyl chloride, the objective is to show polymer formation, but we have not explained bond angles and types of bond in vinyl chloride here. This animation is targeted at K9-K12 students and is not for higher levels. For detailed explanation of bonds, we are coming up with animation on Chemical bonds shortly. Ans: Silane has a formula SiH4 (or SinH2n+2). Silanes are less stable than their carbon analogs. Silane coupling agents hydrolyze in contact with water. Their hydrolysis results forms of HCl, CH3OH, C2H5OH, aklyl ethers etc. Hydrolysis causes the silane-based water repellent to bond with the substrate it is applied to. Alkoxy groups hydrolyze to form silanols, which then condenses to form silsesquioxane networks that interpenetrate with the polymers at the interface and can adsorb onto their surface.